MakerBot Industries unveiled its next-generation personal 3D printer, the Replicator, which comes fully assembled, and features a build area that’s twice the size of its predecessor, the Thing-O-Matic, so that it can build larger 3D objects (the Replicator’s build area is about the size of a loaf bread or 300 cubic inches). 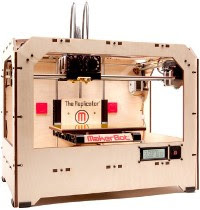 At pricing of $1,749.00, the Replicator is also cheaper than the Thing-O-Matic. Two configurations of the Replicator are available – one for producing an object consisting of a single color, the other for producing two-colored objects. Also new is an LCD panel and video-game-style control pad. The LCD screen provides build statistics and monitoring information, and full control of the printer without having to use a PC. The Replicator uses an additive printing process – it heats and melts ABS plastic (the same material used to make Lego blocks) to print 3D objects layer-by-layer. It’s connected directly to the PC via USB port, and is compatible with Microsoft Windows, Apple OS X, and Linux systems. There’s also an SD Card slot, so users can download model plans and begin builds directly from the control pad without having to use a PC. 3D printing has been called the next billion-dollar industry, with analysts such as ABI Research predicting that it will reach $782.6 million by 2013. To date, it’s primarily used in manufacturing by companies such as Stratasys, Inc., but MakerBot’s Thing-O-Matic and the new Replicator are now within range of many consumers, and in the future 3D printers will probably be even more affordable. Orders currently take six weeks to fulfill. Visit our online store for 2D inkjet printer cartridges & laser printer cartridges. Epson America, Inc., a leading provider of superior performing desktop printing solutions, introduced the Epson Artisan® 1430 wide-format printer. Offering brilliant, Ultra Hi-Definition prints as large as 13”x 19”, convenient wireless networking and mobile printing, the Artisan 1430 enables photo enthusiasts and professionals alike to complete a wide range of creative and professional projects. The Artisan 1430 delivers professional quality photos by leveraging Epson’s exclusive Advanced MicroPiezo® print head with DX5™ technology for accurate ink placement, smooth gradations and amazing skin tones. The Artisan 1430 offers Wi-Fi CERTIFIEDTM n wireless networking to easily share the printer with anyone on the network – as well as Epson iPrint app – to print and share from a smartphone, iPhone®, tablet or other device. With superior media handling capabilities to create gallery-quality prints on a host of popular borderless sizes – including 4”x6”, 13”x19” and 12”x12” – and Adobe® Photoshop® Elements bonus software, the printer is ideal for a range of projects – from brochures and posters to photo enlargements and personalized CDs/DVDs. The Epson Artisan 1430 ($299.99) will be available in February through major computer, office and electronic superstores, a variety of retail stores nationwide and Epson’s retail site. The wide format UV-curable inkjet market is the smallest, yet the most competitive product segment within the wide format digital printing industry, reports InfoTrends. The global market for wide format UV-curable inkjet printers and supplies is expected to grow from $1.42 billion in 2010 to $3.04 billion in 2015 for a five-year compound annual growth rate (CAGR) of 16.4 percent. “We’re finding that dozens of global and regional competitors in the wide format UV-curable inkjet hardware market are being drawn to this segment based on high production volumes and attractive hardware profit margins,” commented Tim Greene, director of InfoTrends Wide Format Service. 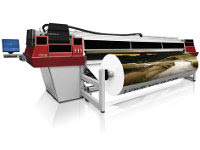 The 2011 Wide Format UV-curable Inkjet & Supplies Market Forecast reveals that UV-curable technology is expected to play an important role in a recentralization of the wide format digital graphics market. In the early stages, a key to success has been providing reliable technology that delivered high-quality print production. InfoTrends’ research indicates the UV-curable market is moving to a new stage where the solutions that surround the printer are increasingly important. The tools that are available that enable automated production and meaningful operational metrics are going to become increasingly important as commercial printers and other “high-end” operators adopt wide format UV-curable printers. Wide format UV-curable printing system providers that understand this, and develop or partner to create solutions packages, will have the greatest selling opportunities. The report is available immediately for purchase. For more information visit InfoTrends’ online store or contact Stephanie Tose at +1 781 616 2103 or email stephanie_tose@infotrends.com. Canon U.S.A. has released the next generation of its uniFlow print-management software, version 5.1, which adds printing from mobile devices, enhanced scanning, and an improved universal print driver. uniFlow server-based software, which supports Canon and third-party devices, is Canon’s print-management software that enables administrators to track users’ printing (as well as Canon MFPs’ copy, scan, and fax), determine document output costs and generate reports, alert IT to status conditions such as low toner, and even monitor their print fleet’s environmental impact. uniFlow also provides user authentication (via PIN, card, user name and password, etc. ), and rules-based printing, the latter of which enables administrators to automatically route print jobs to the most cost-effective printers or force all e-mail messages to be printed in black-and-white, not color. It can automatically convert documents attached to e-mails for scan scan to e-mail into text-editable format. uniFlow provides detailed reports so that, for instance, administrators can see which users are printing in color. Version 5.1 enables users to print from Internet-enabled mobile devices such as smartphones and tablets, including Apple iOS devices, without downloading print drivers or software, via several methods: by submitting the job via e-mail, and uploading a job via Web browser. Users can also print using an Internet-enabled driver. uniFlow’s secure print release is also supported for mobile users, so that print jobs are held until the user releases them for printing via PIN or smart card at the device. There’s also a uniFlow native app for iOS iPod, iPhone and iPad devices. The app enables the mobile device to identify the printer, for example by a QR code, select a print job from the user’s personal print queue, make necessary print settings, and release the job for printing. uniFlow v5.1 also adds enhanced document capture, routing and workflow, providing more scan destinations with direct desktop integration to enable post-scan document processing and manipulation. Also new are advanced features including linking to external databases for validating index information against pre-existing database content. uniFlow v5.1’s universal printer driver contains an improved image compression technology resulting in smaller file sizes and consequently faster print-job processing. Additionally, Canon’s PCL 6 Generic print driver now supports secure printing, which includes the ability to make to make document finishing changes at an imageRunner Advance MFP, which in the past was only possible with the uniFLOW Universal Driver. 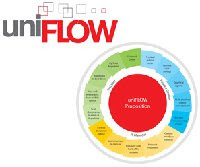 For more information on uniFlow in general, click here. Brother International Corporation, a leader in color laser units for small office environments, has announced the launch of four new digital color units that utilize Brother LED technology. Brother has added two printer (HL-3045CN, HL-3075CW) and two all-in-one (MFC-9125CN, MFC-9325CW) units, which offer a category-leading color print speed of up to 19ppm – up to four times faster than competing Color Laser Printers and All-in-Ones, built-in networking and utilize Brother LED print technology for a fast, compact machine that will help enhance the productivity in any small business environment. These new models will be available beginning in January 2012. Known for award-winning reliability and support, these new machines offer multiple opportunities for efficiencies within a small business environment. The units' category-leading color print speed significantly increases the level of output available to small business owners and helps save time when shared by multiple users on a network. Additionally, the units provide the convenience of producing high-quality, vibrant and professional looking documents in-house instead of sending out to a commercial copy center. These two features make the new Digital Color Printers and All-in-Ones the smart choice for small business owners looking for the convenience of affordable color printing. "Small business owners are always looking to maximize efficiencies," said Steven Feldstein, director of marketing, laser products and scanners. "These new units offer significant value in both time and money with faster color printing, savings gained by printing in-house and overall reliability so small business owners know when they buy a Brother digital color printer, they are getting a solution that will go the distance for their business at a great price." These new units (except the HL-3045CN) are also compatible with Brother™ iPrint&Scan free downloadable printing app for Apple, Android or Windows Phone 7 mobile devices on a wireless network. This app is a great tool for small business owners on the go to be able to access normal office functions, including printing and scanning, when urgent needs arise. The latest series of Brother Printers and AiOs will be available at national office superstores, retailers, dealers and online resellers. Visit our redesigned web store for Brother inkjet cartridges and Brother laser toner cartridges. 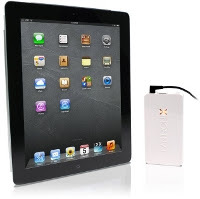 Lantronix has rolled out the first Apple iOS print server compatible with Apple iPad 2, iPad, iPhone, and iPod touch mobile devices, and virtually any device running Apple’s iOS mobile operating system. The new xPrintServer, which is about the size of an iPhone, provides an exceptionally easy solution for printing from Apple devices. Just plug the xPrintServer anywhere into the network via Ethernet cable, and print wirelessly from any iOS device running iOS 4.2 or later, to virtually any printer connected to the wired or wireless network. The xPrintServer, which uses the iOS native print menu, automatically discovers printers on the network – with no need to use apps, print drivers, or other software. Lantronix says the xPrintServer, which retails for $149.95, currently supports thousands of printers from vendors such as Hewlett-Packard, Brother, Epson, Canon, Dell, Lexmark, and Xerox. As new printer brands and printer models become available, Lantronix will post updates on www.Lantronix.com. For a list of supported printers, see here. The firm says it’s tested the server in-house, and that third-party QualityLogic has also successfully tested the server. See the video demonstrating the xPrintServer at xPrintServer launch video. The xPrintServer is currently available for pre-ordering at store.Lantronix.com. It’ll begin shipping in 2012’s first quarter. The firm, which is headquartered in Irvine, CA, and founded in 1989, markets secure communication technologies that enable remote access, management, and control of virtually any electronic device regardless of location, and its products are used in the security, building and industrial automation industries, as well as in medical, IT/data center, government, transportation, pro AV/signage, retail, and power and utility industries. Visit our redesigned web store for high quality OEM, compatible & remanufactured inkjet cartridges, laser toner cartridges & printer ribbons.